If you missed the start of the auction – please do go check it out! Auction is live through the end of September. (Ignore the Jan 2018 dates, I can’t get rid of them!) Puerto Ricans are stocking up right now due to storms heading their way, and some are going through PTSD – let’s raise tons of money and send them some encouragement! It’s new release day! 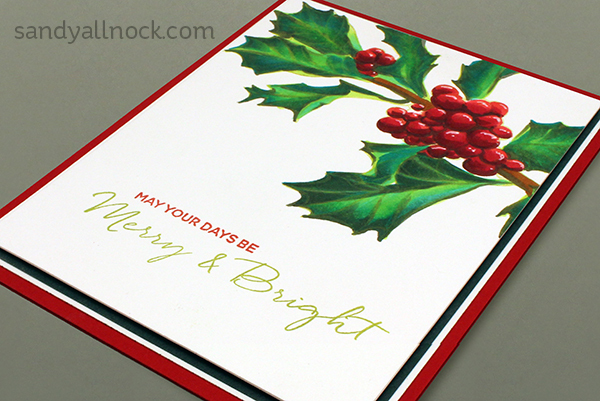 It’s a good one – topped off with this beautiful Mondo Holly designed by the amazing Julie Ebersole. (Have you seen her new blog by the way?) 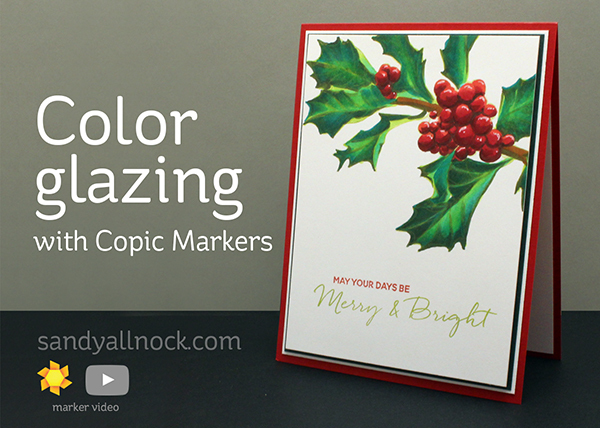 Today’s video colors the holly using glazing – since greens are the bane of my existence with Copics! Watch the video below or click HERE to see it in HD on YouTube. Such a pretty stamp, and when colored beautifully it makes what I think can be called a clean and simple card? Whatcha think? Indeed GORGEOUS! I love the great stamp and the way you coloured this, that was awsome. Thank you so much Sandy, again someting learned. Gorgeous sprig, beautiful colours, was great to see them just appear off the cardstock. Berry nice. Look forward to more Christmas images. So beautiful. You certainly do magic with your markers. Beautiful holly branch—so much depth of color. I also love the scripty sentiment. Another stunning project and tons of valuable tips. Thank you. You’re so right – this is GORGEOUS! Love the whole “glazing” idea to get the right greens – it’s been a problem for me always. Thank you so much! Now I’m off to Ellen Hutson’s to see the whole release and get one of these holly stamps before they fly off the shelves.